Everyone scrambles to keep Regime Superman under wraps, but it's all a diversion, as Damian Wayne is the true objective. Story - 3: Not a very satisfying issue. 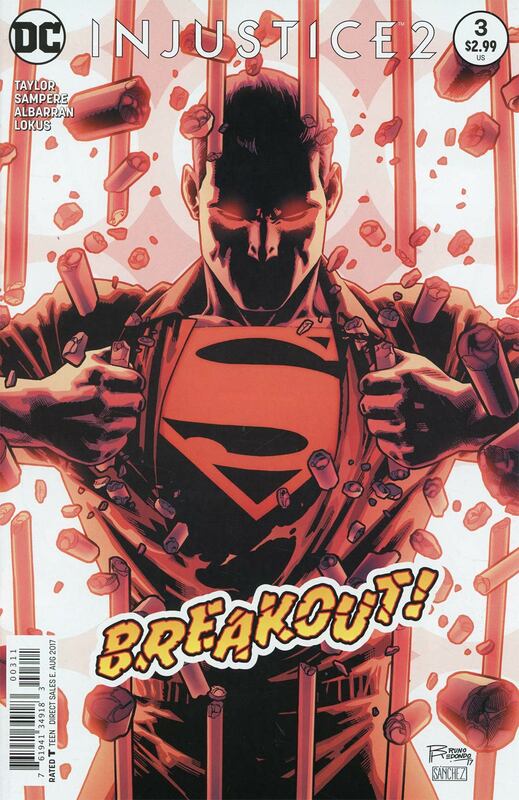 Regime Superman is taken down in a Deux et Machina fashion, and continues to be the lackluster villain that he became after Tom Taylor left the series... which is ironic since Tom Taylor is now back on Injustice. The introduction of the "Daughter of the Batman" doesn't move the needle with this reader, as Injustice already has enough moving pieces and one more doesn't truly seem necessary. It's well known that the series is to function as a prelude to the already released video game, but as the game is out, one can only hope that the story picks up speed... with speed. Art - 3: The Atom's rendering in Regime Superman's brain stood out for the lack of accuracy. One, the brain area wouldn't look like that. Two, Kryptonite that small can affect Regime Superman that greatly? He really is a dime-a-dozen villain. Cover Art - 3: Perfectly serviceable.